HONOLULU, Hawaii, May 17, 2012 (ENS) – Hawaii has just become the first U.S. state to enact a statewide ban on plastic bags. While no law has yet been passed on the state level, each of the counties in the state has now enacted its own plastic bag ban, making the ban statewide in practice without a state law. Honolulu Mayor Peter Carlisle Friday signed a bill banning the distribution of plastic bags by retailers beginning July 1, 2015. So Hawaii residents and visitors alike will have three years to learn to take reusable bags with them when they go shopping. The City and County of Honolulu, which encompasses all of the island of Oahu, was the last of Hawaii’s counties to enact a ban on single-use plastic bags at the point of sale. The Honolulu City Council approved the bill on a 7-1 vote on April 25. Bans are already in place in Maui County, which includes the islands of Maui, Molokai, Lanai and Koho’olawe, and in Kauai County, which covers all of the island of Kauai. 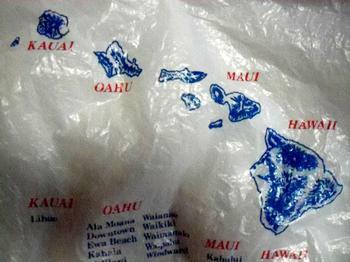 Last December, Hawaii County, the Big Island’s jurisdiction, passed a plastic bag ban that will take effect next year. A business caught violating the measure would be fined between $100 and $1,000 for each day of violation. As the Honolulu bill was working its way through the political process, consumers and environmentalists testified in support of the ban while some retailers wanted a ban that also would take into consideration paper bags. Under the new law, plastic bags would still be allowed if they are distributed to package loose fruit, vegetables and nuts, or to contain or wrap specialty items such as frozen foods, prepared foods, beverages, flowers, laundry or live fish. The many exceptions to the law include bags provided by pharmacists to contain prescription medications, newspaper bags for home delivery, door-hanger bags, and laundry, dry cleaning, or garment bags, including bags provided by hotels to guests to contain wet or dirty clothing. Bags sold in packages containing multiple bags intended for use as garbage, pet waste, or yard waste bags are exempt, and so are bags used to transport chemical pesticides, drain-cleaning chemicals, or other caustic chemicals sold at the retail level, provided that this exemption is limited to one bag per customer. The Oahu campaign was marked with some drama. On February 9, Kalani High School sophomore Diana Sellner and her friends staked 400 plastic grocery bags to the state Capitol lawn in Honolulu to call attention to the 400 million plastic bags now used each year on the island of Oahu.